The employment data is hiding a lot of pain. 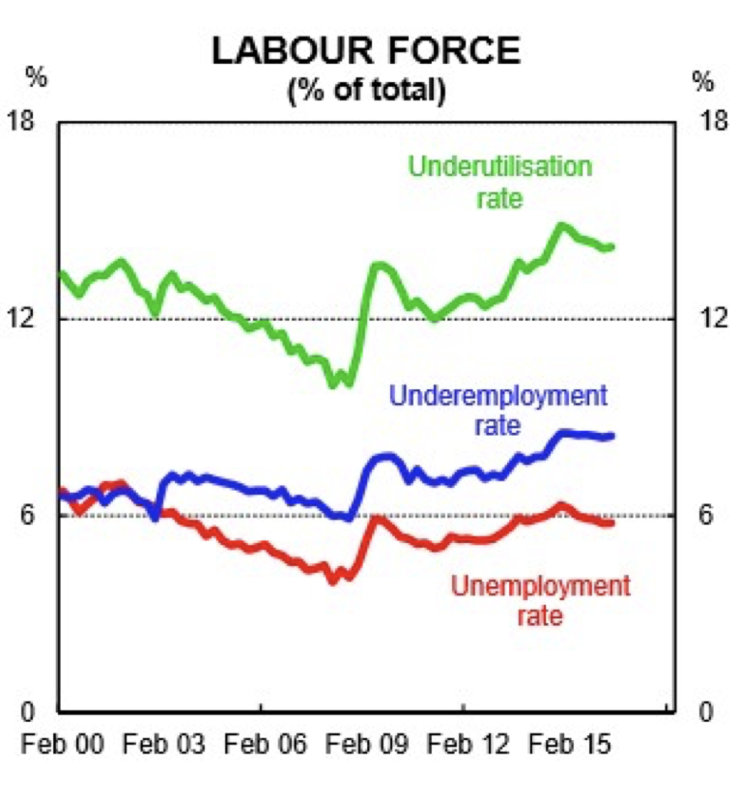 On the face of it, an unemployment rate that’s still below 6% is pretty good. Compared to what’s going on in a lot of places around the world, Australia is still doing pretty well. But things aren’t all they seem. And the good’ish headline figure hides a world of pain for a lot of people. Because we’re seeing the labour market being ‘hollowed out’. That is, solid full-time jobs are being replaced with precarious part-time jobs. And if someone loses a full-time jobs and picks up a part-time job, the unemployment rate stays the same. But there’s been a big change in their personal circumstances. And the truth is that nearly all of the jobs created over the past year have been part-time. 87% in fact, according to the ABS. 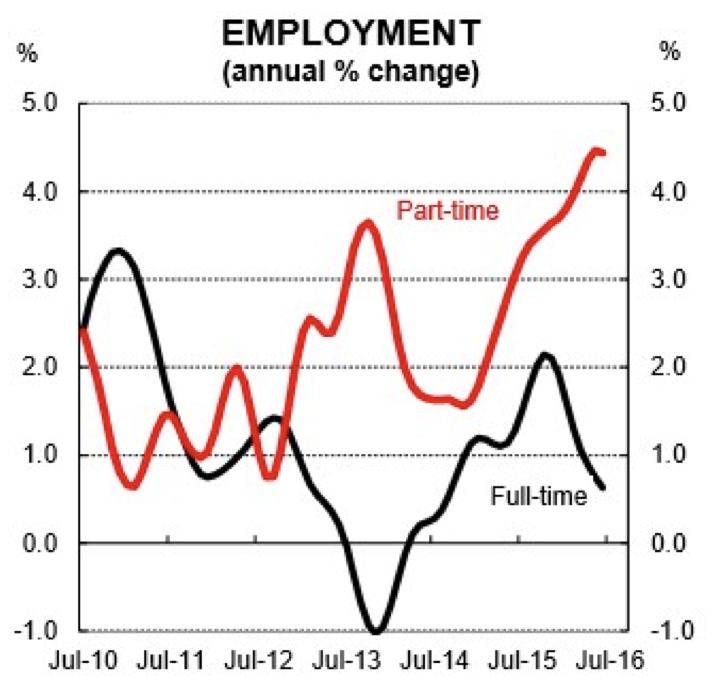 So part-time employment is booming, growing at more than 4% a year. Full-time work is starting to splutter – growing at less that 1% a year. When you remember that the working age population is growing by something like 1.2-1.5% a year, this tells you we’re not creating enough full-time jobs to cater to new job-seekers, let alone the old ones. That’s not a picture of an economy going great guns. If you’re a full-time worker relying on a regular amount of hours to get by, you could be in trouble. A lot of the story here is the way jobs are churning between industries. 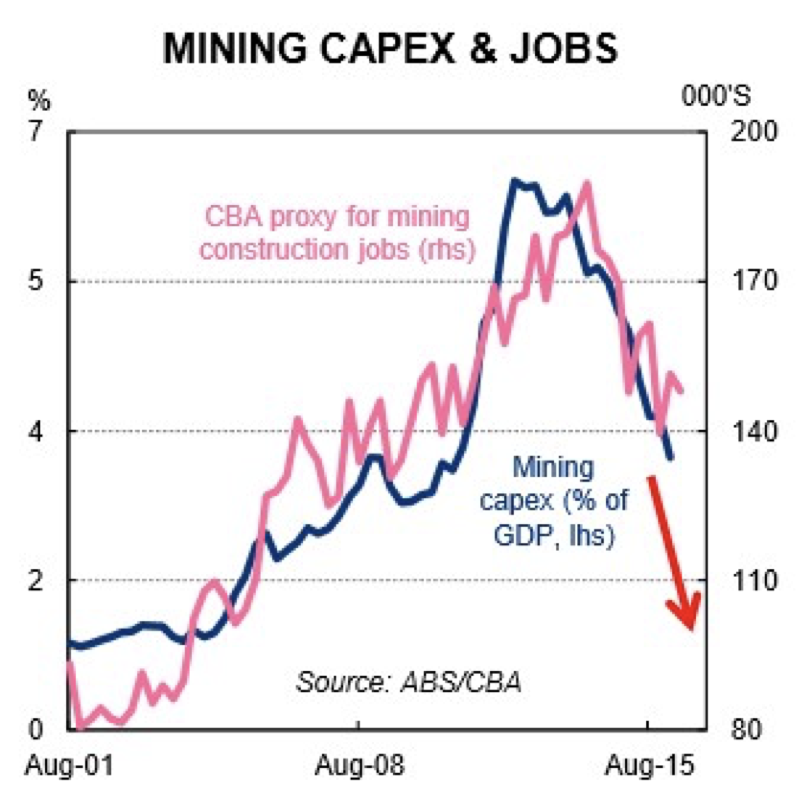 As we know, mining employment has taken a knock in recent years, and the mining industry has been shedding jobs. This wasn’t entirely unexpected, with mines employing a lot more people in the construction phase than the operations phase. But still, the jobs that have been lost have been mostly solid, full-time jobs. And where have the gains been made? As this chart shows, loses in mining and manufacturing have been made up for by increases in health (especially aged-care) and tourism. 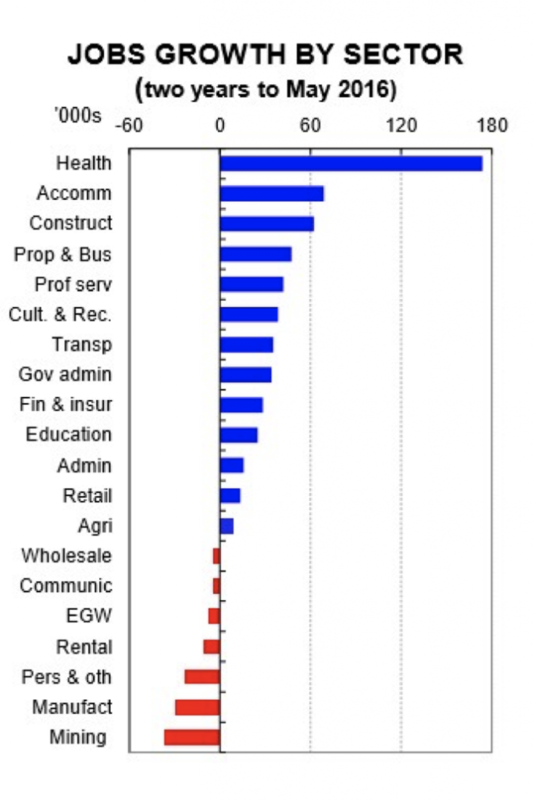 However, these sectors are much more likely to have people employed on a part-time basis. This creates a bit of a tough story for our blokes, when you remember that mining and manufacturing tend to employ males, while health and tourism have much higher female participation. Not that that’s how it should be. Just how it’s been historically. 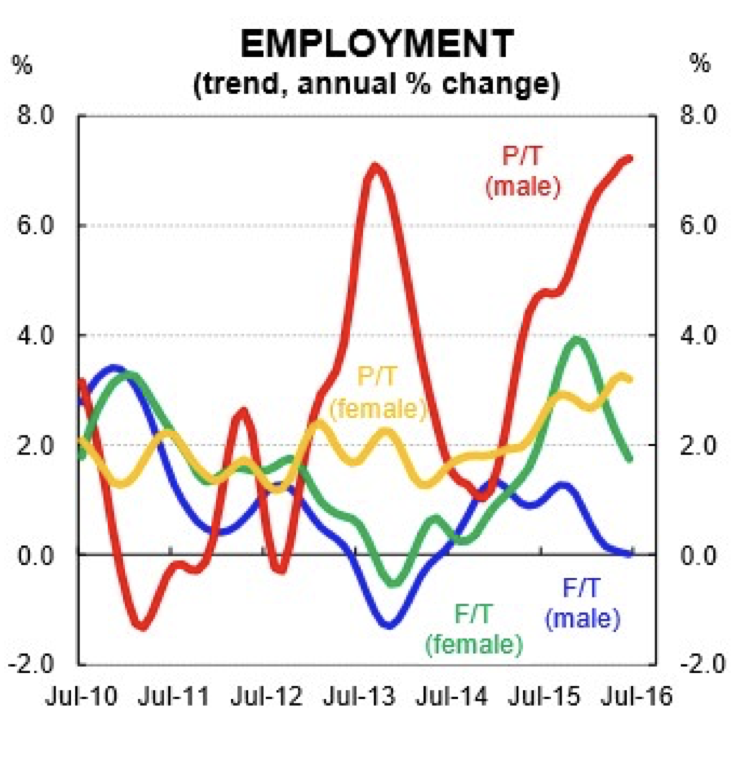 But what it means is that our blokes are bearing the brunt of this transition. 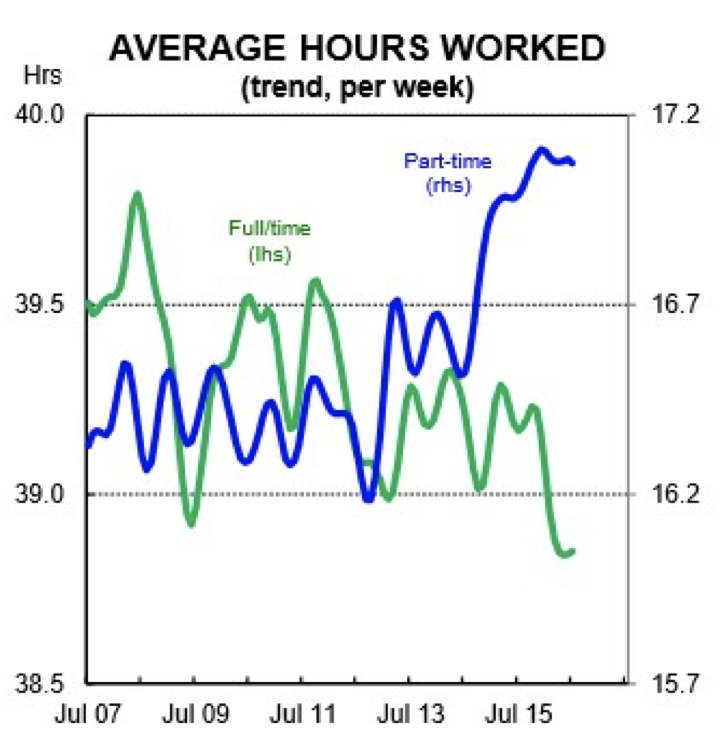 Recently male full-time work started falling, with a large spike in male part-time work. Many men have also just packed it in and left the workforce altogether. 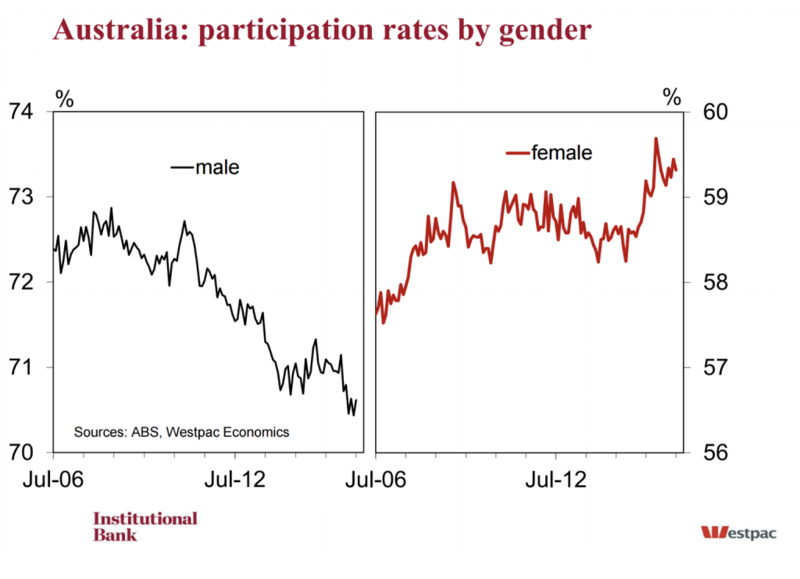 Male labour force participation continues to plumb new lows. And of course the big consideration here is that part-time work generally doesn’t pay as well as full-time work. 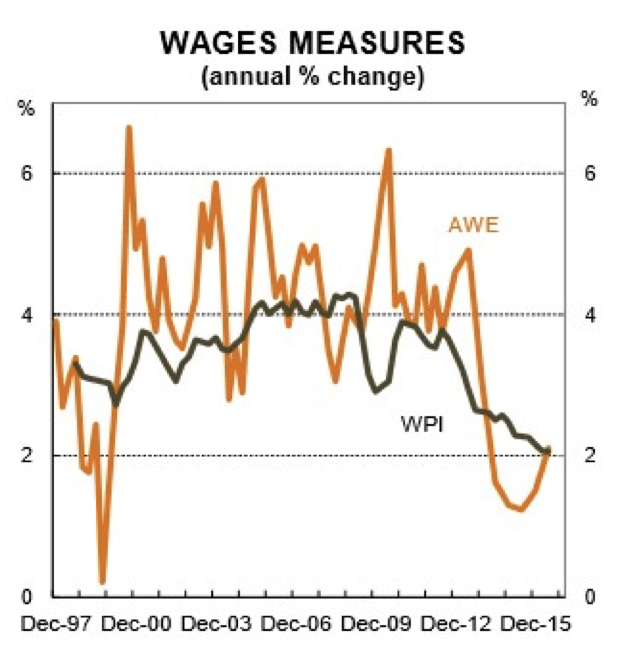 And this is one of the key reasons why wages growth has fallen to record lows, and looks set to keep heading lower. And I’d love to tell you there’s a silver lining to all this, but there’s nothing but dark clouds on the horizon. Automation is gunning for a lot of jobs we took for granted. Driverless semi-trailers are already cruising the Nevada desert. Some mines in Australia have no employees located on-site. Now I’m not here to scare you. But I’m not here to sell powder-puff either. These changes are coming. Full-time work as our generation knew it is dying a slow death. The age of the male breadwinner household is behind us. The only question is what you’re going to do about it. To survive and thrive in the new world order, we’re all going to have to work smarter. We’ll need multiple skill-sets and multiple income-sources. We’ll all need to run our own businesses – the business of being us. My recommendation, for what its worth, is that property investment is a solid feather to have in your career cap. The property market is changing, but it’s not being made obsolete. What’s more, it offers excellent opportunities for ordinary people who are willing to put in a bit of hard yakka to create supplementary income streams – even replace their day job altogether. A property portfolio can be an excellent way to future proof yourself. Have you born the brunt of these changes? What’s your game-plan now?